Growing up on her family’s ranch in Oklahoma, Kaci Cronkhite never saw the ocean until she was 20. By the time she was 40, she’d sailed around the world. A voyage in 2001 brought her to Port Townsend, WA, and she remained in town for the Wooden Boat Festival. Finding herself temporarily grounded after the events of September 11, she decided to stay in the “City of Dreams” and was eventually offered a job as director of the aforementioned festival. 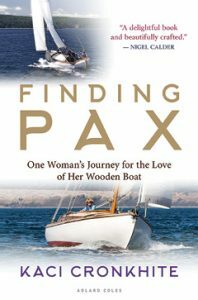 Finding Pax made the “shortlist” for the UK Maritime Foundation’s annual Mountbatten Media Awards in the “Best Book” category (with the award to be presented just after this magazine went to press), and the author gave a lecture at the Herreshoff Marine Museum in Bristol, RI last month. A beautifully crafted story of love, discovery and adventure, Finding Pax is highly recommended. A writer with a passion for adventures combining wind, travel, history and legacy, Kaci Cronkhite spent nearly a decade sailing around the world, followed by a decade in leadership roles at the Wooden Boat Foundation and the Northwest Maritime Center in Port Townsend, WA. Her articles have appeared in the sea anthology Steady as She Goes and in publications in the U.S., Canada, Australia, South Africa, and the Caribbean. Finding Pax is her first book, and she’s working on a prequel, When a Cowgirl Goes to Sea. To learn more, visit kacicronkhite.com. Sailing Hall of Fame Coming to Newport!